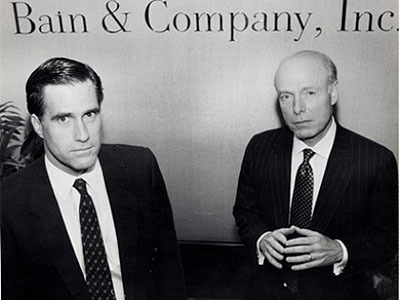 If Conard is right, Romney not only wasn’t involved in Bain’s business during this period, he was up to his neck in so many alligators that he could barely spare the time to negotiate his own retirement package. I have to say, that doesn’t sound like a person who was keeping himself aware of what was happening at Bain, let alone taking even a modest hand in making management decisions. Bain is Bain. Even if Romney wasn’t much involved in management after 1999, it was still the company he built. The only problem is that back during the primaries he became so desperate to avoid being tainted by the unpopular aspects of running a ruthless private equity firm that he panicked when the inevitable attacks came and started insisting that he shouldn’t be held responsible at all for anything Bain-related after precisely February 1999. This has since been followed by increasingly wobbly towers of nonsense, like Ed Gillespie’s claim today that Romney “retired retroactively.” This was never really tenable from the start, and all of Romney’s problems have flowed from that original miscalculation. He can’t run from Bain, and he shouldn’t have tried.